Ben Nye's innovative effects color produce realistic wounds, bruises, burns, age stippling and contouring. Excellent for all performing arts as well as mass casualty exercises. 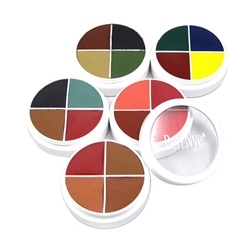 Palettes include four highly pigmented shades. Each wheel is .5oz./14gm. Expect 50-300 designs per wheel. Choose from: Bruises, Cuts & Bruises, Bruise & Abrasions, Burns & Blisters, Age Stipple, Severe Exposure, Old Character I, Old Character II and Camouflage.